Written by: Priya Potapragada on February 5, 2018. Education is a significant determinant in the course of one’s life, and for that reason access to learning at an early age is vitally important. The educational system in Africa has struggled for a number of reasons including historical factors, political and social strife. To this, more mundane realities add another layer of challenge, such as the vast distances pupils must sometimes walk to attend classes; which can also mean necessary chores go undone. Rural and economically disadvantaged populations are particularly marginalized. Kenya, a country with 2.5 million unemployed young people, has made tremendous progress in its education system; providing free schooling at a primary level and enacting initiatives to increase enrollment. It is, however, still a country with high numbers of children not enrolled in school—in 2010, 1 million children were estimated to not be in school. According to UNICEF, 42% of Kenya’s population lives beneath the poverty line, meaning they earn less than $1 per day. Although primary school is free, it is still out of reach for many impoverished families as uniforms, books, food, and school supplies are not provided. Safisha Africa Welfare Foundation (SAWF) aims to reduce the number of children who don’t have the means to attend school, and alleviate the financial barriers that prohibit their learning so that all children can access a quality education. 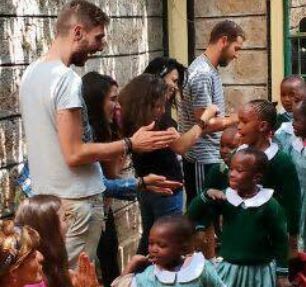 With a particular focus on slums and settlements within Nairobi, SAWF strives to provide educational opportunities for children who would otherwise not be able to attend school. Through a grant made by CAF America, SAWF has been able to purchase text and exercise books, writing materials, and other necessary school equipment that facilitate the learning process for its students. Since its founding in 2010, SAWF has successfully assisted more than 500 children in obtaining and maintaining a quality education. Donations have enabled the foundation to pay salaries and rent, as well as continue its work in advocating for children’s right to education. The program that has been established also ensures that children are receiving at least one meal a day. The poorest slums within Nairobi often have families with several children, usually surviving off a single income parent, making it difficult for the parent to work and provide for the family. SAWF provides meals for its students and reduces the pressures felt by both the children and their parents. Given that the students attending SAWF can be from different backgrounds and income levels, grant-funded uniforms provide the students with a sense of pride and belonging while also equalizing the students and ensuring no child feels disadvantaged compared to their peers. One of the most important items that was funded are shoes, allowing children to walk to and from school without the risk of injury and infection. By having access to education and nutrition, these children gain opportunities they would not have had without attending schooling. Safisha Africa Welfare Foundation works to address the core challenge of access to education and provides its students the opportunities for a better future.